Understanding basic principle of the lighting helps to chose right modifiers and positioning of them to the subject in photography. Why closer lights or larger light modifiers creating softer shadows. I created few illustration to show how light distribution works. With one light source casting light on object we will have define two areas of shadows. 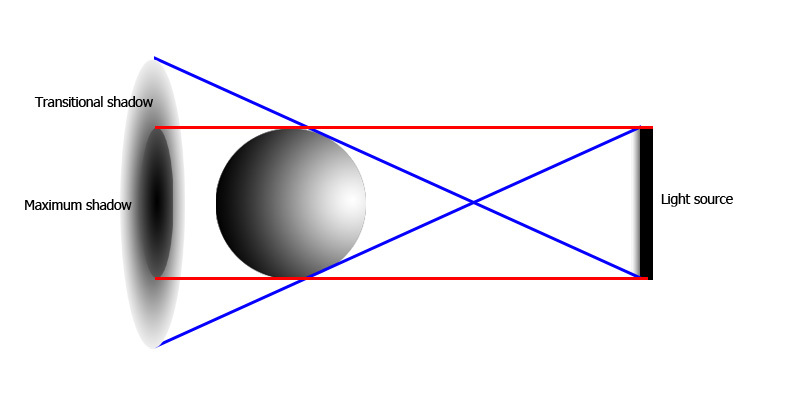 Full shadow and Transitional shadow. Full shadow created by object abstracting full ray of lights and transitional by abstracting parts of the light. Transitional shadow area will create smooth gradient in shadow. 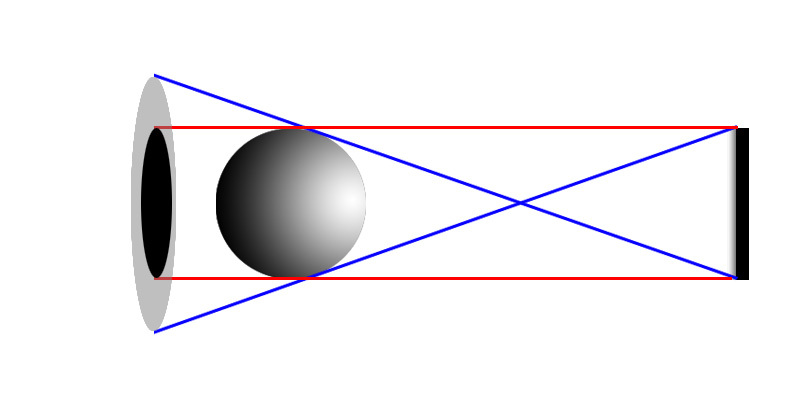 Full shadow area can be define by draw strait lines from outside light source to the outside edge of the object (Red lines). Inside that area you will have most filled shadow. 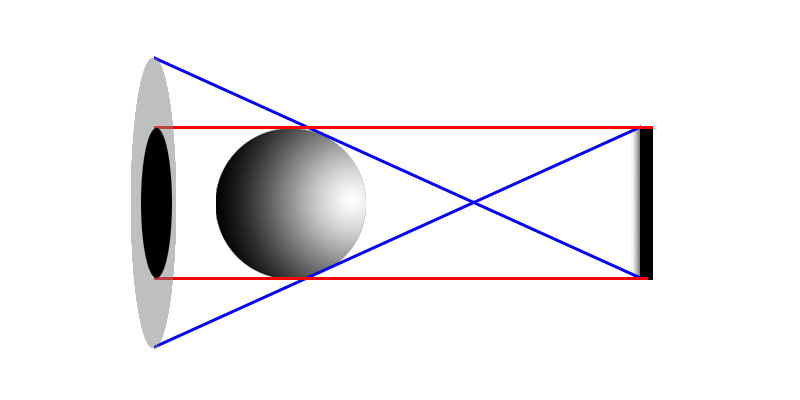 By draw lines from outside light source to opposite side of the object, you will define area if the transitional shadows. 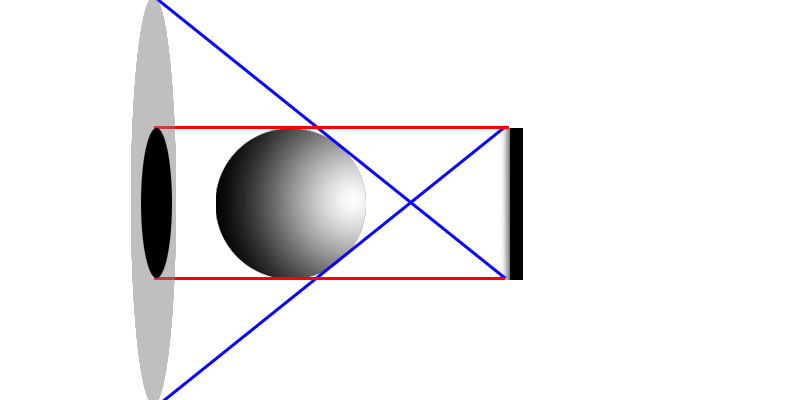 Light source can be modified by intensity, position or size. You can effect areas of the shadows by moving light source closer to object or away. or by increasing size of the modifier. High textured surface in 2d photography representing by contrasts between darker and lighter areas. By minimizing area with full shadows will smooth out textures. As example if you want remove wrinkles and smooth out texture of the skin, use larger light modifiers ( they spread light distribution cross wider areas, or/ and bring light source closer to the subject. Shape of the modifier and additional grids will also effect shadows. When compositing in post process and adding shadows I use at list two type of shadows for each light source. Also take in consideration of the overlay shadows ( increasing opacity in shadow area) , or bounced lights (renderosity) that will subtracts shadow density.